Posted by @mikepetrucci with the following caption: "Welcome to the DC Metro. Thanks for riding with us. Sit back, get comfortable, and enjoy the ride." It is beyond my imagination on the incident that took place today at approximately 9:11am. I boarded the P17 bus at Fort Washington Park and Ride at 7:40am but the driver informed us that there was a problem with his bus and he was calling his supervisor to see if another bus could be sent. Fortunately, another bus showed up very quickly (P17) and we started our journey to DC. When we reached 7th st NW, Washington DC, a bunch of Metro Supervisers stopped the bus, ordered everyone out of the bus and started accusing the driver being early on his route. They detained the bus for 20 minutes, offering no assistance to us (passengers) who by that time we were already late to work. After 20 minutes of waiting in limbo, these supervisors allowed us to board the bus so that it could run on time. The reason I'm complaining about this stupid initiative taken by these supervisors is: (1) they did not want to listen to the driver or passengers the reason this bus was running ahead of schedule (2) what puzzles me beyond belief is what did Metro gain by detaining this bus for 20 minutes? The driver bus was not going to be on service after dropping the passengers at Farragut Square (3) The supervisors could have just taken the driver information and allowed him to proceed dropping passengers instead of detaining the bus for 20 minutes for stupid reason. Is Metro really serious in improving its services? Does metro care - I certainly do not think so. keep up these "rider hall of shame" posts, these are hilarious! One day I may regret it if I am snapped doing something silly, but I enjoy these now. 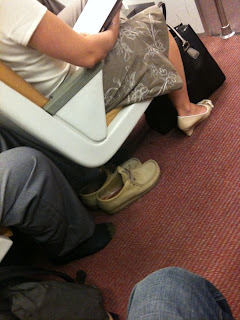 It always amazes me at the things people do on the Metro. In all fairness, considering how long it takes for Metro to cover its "25 minute" routes these days, that person's probably ahead of the rest of us anyway - at least said person has sat back, got comfortable and is enjoying the ride! I love these Hall of Shame posts, but in reality, this person isn't so bad. At least Mr. Footloose seems to have all his possessions and body parts within his personal space, and isn't taking up two seats or otherwise inconveniencing anyone by taking off his shoes.